Fishing for hake: A fleet of twelve 14m-21m boats fish from Newlyn for hake. Although trawlers and beam trawlers catch small quantities of hake in their trawls, it is gill netting that has developed into a highly targeted hake fishery. In the early years of the fishery, boats used multi-monofilament nylon net until it was discovered that mono nylon was more effective. 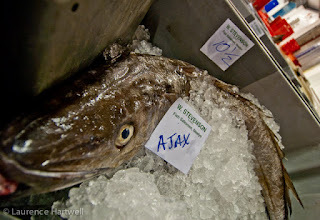 Lifestyle: Hake fish come from the same family (Phycidae) as cod and haddock. It is a long, powerful fish which averages around 1-2 kg, but which can grow to over 10 kg. Seldom caught - hake in excess of 10kg. Hake can grow up to 1 metre in length and their lifespan can be around 14 years. Seldom caught on inshore fishing grounds, they are found in water ranging in depth from 200-350 metres. All hake species stay nearer the bottom during the day and come to the middle depths during the night. They are voracious predators which feed on other species found near or on the bottom of the sea. When gutted at sea their stomachs are often found stuffed full of small, whole fish. The male and female hake fish look almost the same and are not easily differentiated. Hake Gill Netting: Gill net boats are restricted naturally to the number of days that they can fish by the height of the tide. The higher the tide (as in a Spring Tide) the more quickly it ebbs and floes - indicated by the tidal co-efficient, the degree to which the tide changes. During bigger tides, the net, fixed to the bottom, is pushed flat by the movement of the water which prevents as many fish from being caught. As a rule, the boats cannot fish when the tide approaches 18ft (5.5metres) - as measured at Newlyn. Bigger tides can also cause the nets to shift and roll up in the process - more work and no gain for the fisherman. Each net, mounted between a head rope and a foot rope is made of 0.65mm diameter monofilament nylon with a mesh size of 4 7/8" by 45 meshes deep - net meshes are measured across the diagonal, from point to point. The meshes are set 5 into 3 - that is 5 meshes are picked up in 14 5/8" staple length along the head rope. The net is hung from a head rope of 10mm and 8mm doubled with an 85gm float set every fathom (six foot). The foot rope is 12mm leaded 3ply polypropylene, the lead helps keep the net tight to the bottom. For the Ajax, a single net is 125 yard long and theses are then joined together in groups of 32 to form a tier (varies on different sized boats). Bagging nets to be returned ashore for mending. When fishing, the Ajax works six tiers of nets as each has to fit safely in the net pounds on deck when the gear is boarded. The tiers are normally shot into (against) the tide and hauled with the tide to prevent damage. Plenty of fish - the man on the hauler assists the man in the side deck 'picking out' fish. One man stands behind the net hauler and guides each fish away from the rollers which would otherwise crush the fish. Another man stands in the 'side deck and picks out each fish - this has to be done quickly as the hauler is seldom stopped as the boat is constantly going ahead. How nets are shot and hauled. At either end of a tier of nets is a marker or dhan from which a short length of floaty rope goes to a buoy or buff attached to which is attached a much heavier 'dhan rope' that goes to the sea bed. Either end of the tier is held in place with an anchor. When hauling, the skipper's job is to keep the boat over the net so that it is always leading slightly ahead of the boat - leading astern the net can float up into the propellor - too far ahead and the net is dragged across the bottom and damage the fish and net. Weed and plankton (known as 'glit') can cause the net to be dragged down and fish less efficiently. Click to see how the echo sounder meters under the boat. An echo sounder transmits sounds or pulses from a transducer located on the outside of the hull near the keel. The sound waves (sound travels seven times faster in water than it does in air) bounce of the bottom or fish targets (or wrecks) and are then picked up by the receiving end of the transducer and the information fed to a video display in the wheelhouse. Sometimes net boats will shoot their nets over ground without seeing any marks on the echo sounder and still get big hauls of fish - as fish have tails they are want to move across the 'ground' so a lack of marks that might indicate the presence of fish is not always needed. 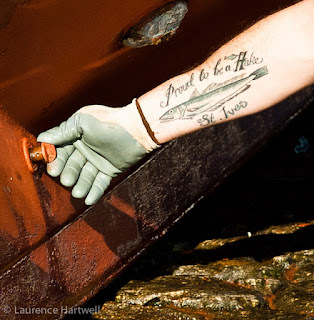 The echo sounder is used to show the skipper what kind of seabed he is over - trawlers want to see a flat bottom with no signs of 'rough ground' on which they might damage the trawl being towed - net boats can work over rough ground - like the animation sequence above. On most days, five tiers are 'shot' over the fishing ground to keep up the quality of the fish, though if the fishing is slack all six tiers will be used as they can be hauled more quickly - heavy fishing can at least double the length of time it takes to haul the net. The fish caught are gutted, cleaned, washed and then iced away between hailing tiers. 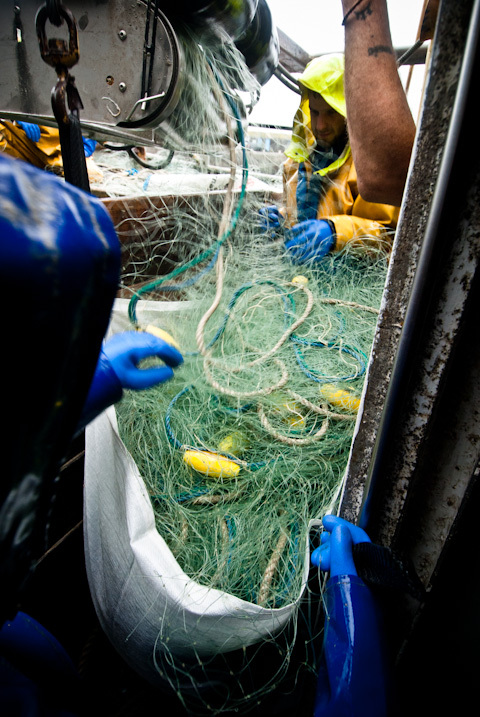 At the end of each trip, damaged nets are selected and sent ashore for repair and new or re-set nets taken on board to replace them. That way the fleet of nets is kept in top fishing condition. Unlike trawling, gill netters can fish over rough and rocky ground without risking losing their gear - net boats often shoot gear over or near wrecks specifically for big 'wreck fish' like pollock, saithe and ling. Netting requires a much less powerful engine and reduces the wear and tear on a boat compared to a trawler or beam trawler. With the high cost of fuel today these can present significant savings to the operation. With a total of nine days planned for the trip, watch as the Ajax makes her second landing of hake and white fish. The first 100 boxes of hake are destined for auction at Brixham and loaded on to waiting transport. The rest of the landing is held in the fish market fridge overnight in Newlyn ready for the market staff to sort, grade, weigh and tally in the morning. The weekdays only fish auction starts at 6am. A short video showing net maker Fred at work rigging hake gear. Watching carefully, you can see Fred 'picking up' five meshes at a time which are then 'set' into the space of three - using the marked orange rope nearest as a guide. ...not that this fisherman from St Ives cares. When working west of the scillies, the Ajax often works alongside much larger Spanish vessels fishing for hake in the deeper waters off Ireland. These boats are over 30m with a crew of over a dozen or more men on board. They shoot miles of monofilament nylon long lines with baited (preferably with sardine) hooks to fish for hake. Also working in the same area are the Spanish trawlers working in the deep water for megrim soles and monks who also catch hake, the smallest of which - known as 'cigars, or cigarillos' which they resemble in size and shape - are considered a delicacy and fried whole - examples can be seen for sale on many Spanish fish markets. Use of anchored gill and tangle nets around the UK - RS Millner 1985 Cefas, Lowestoft.